Second World War – Sara S. Goek, Ph.D.
On February 19, 1942 – two months after the attack on Pearl Harbor – President Franklin Delano Roosevelt signed Executive Order 9066. It authorized the establishment of military areas “from which any or all persons may be excluded” in the interest of national security and defense. In broad terms, it gave the military power to decide who constituted a threat. It did not, as many discussions of it imply, specifically mention Japanese Americans. That fact does not make it any less pernicious. We were told that we are being evacuated so that the government can protect us. The first thing that I had observed was that they had armaments, not facing out, but facing in. No evidence supported the perceived threat. Rather, its origins lay in racism and fear. Adding the two and throwing government propaganda into the mix meant the policy enjoyed widespread support. Both the press and Congress almost unanimously endorsed it. Groups supposedly committed to ending discrimination either supported the policy or looked on in silence as the “gravest violation in civil liberties since the end of slavery” took place. Many understand the historical lesson of Japanese-American internment, like that of the Holocaust, to be “never again”. But there is another important lesson. It could happen again. Fear is part of human nature and those in power have repeatedly harnessed it against the ‘others’ in society. The record of internment should stand today not as a monument to a past from which we may safely distance ourselves, but as a reminder of what is possible and what we should do all in our power to resist. Executive Order 9066, February 19, 1942. Full text available from: http://historymatters.gmu.edu/d/5154. Civilian Exclusion Order, San Francisco, California, May 15, 1942. 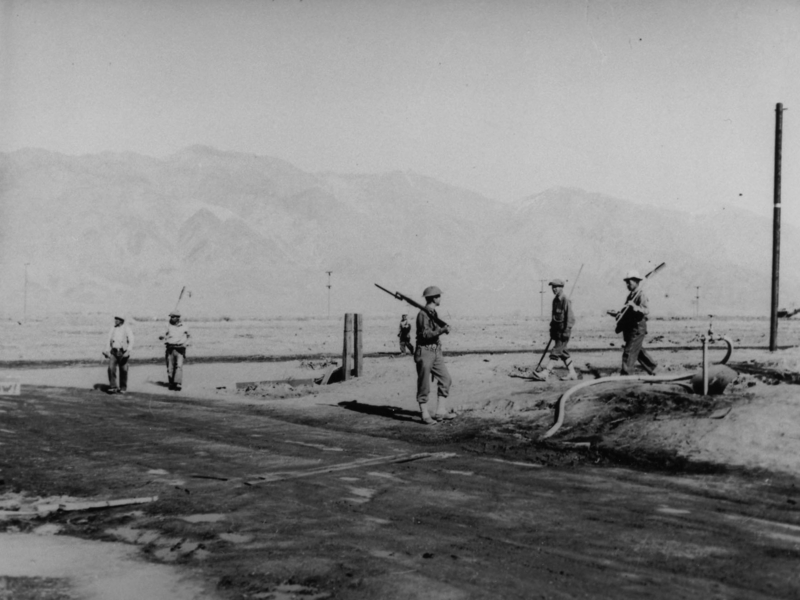 Remembering Manzanar, documentary film (National Park Service, 2004). Eric Foner, The Story of American Freedom (New York: W.W. Norton & Company, 1999), p.241. In war, “you don’t become a killer. No normal man who has smelled and associated with death ever wants to see any more of it,” wrote cartoonist Bill Mauldin (1921-2003) in his book Up Front: “The surest way to become a pacifist is to join the infantry.” His cartoons contained few feats of heroism. Instead, his central characters Willie and Joe griped about the weather, the rations, and their superiors. Stars and Stripes, March 2, 1944. Source: Military History Now. I don’t make the infantryman look noble, because he couldn’t look noble even if he tried. Still there is a certain nobility and dignity in combat soldiers and medical aid men with dirt in their ears. They are rough and their language gets coarse because they live a life stripped of convention and niceties. Their nobility and dignity come from the way they live unselfishly and risk their lives to help each other. They are normal people who have been put where they are, and whose actions and feelings have been molded by their circumstances. Like war correspondent Ernie Pyle, Mauldin gave GIs on the front in World War II both their dignity and a recognizable image of themselves. His cartoons balanced realism and respect for the combat soldier with humor and a healthy dose of cynicism. Pyle himself played an important role in bringing Mauldin’s work to a wider audience. 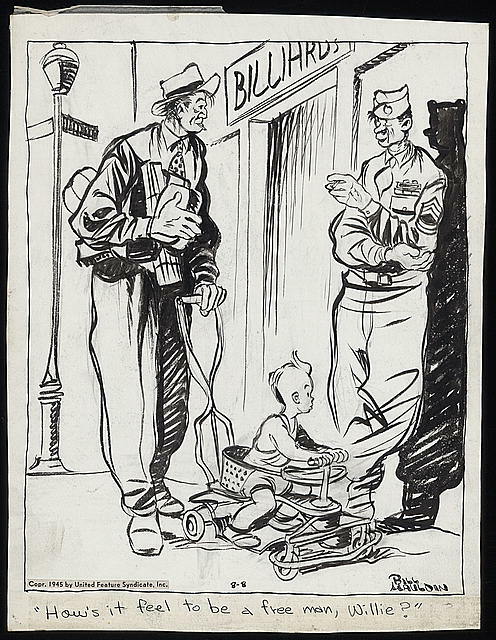 In January 1944 he wrote, “Mauldin’s cartoons aren’t about training-camp life, which you at home are best acquainted with. They are about the men in the line – the tiny percentage of our vast army who are actually up there in that other world doing the dying. His cartoons are about the war.” As a result of this coverage, his series Up Front was syndicated in papers across the nation. I first encountered Mauldin’s work in that form. When my mom moved to a new house a couple years ago, among the boxes we discovered one that her parents had kept for her when they moved decades earlier. It contained an old cigar box labeled “Bill Mauldin Cartoons (Collected by W.G.M. )” with over 200 newspaper clippings that my great-grandfather had cut from The Cleveland Press during the war and its aftermath. I don’t know why he kept them. His son, my great-uncle, had fought in the Italian campaign (as did Mauldin), so perhaps that connection had something to do with it. Or perhaps, like so many other Americans, he saw in them something of the realities of a war taking place thousands of miles away. United Feature Syndicate, Aug. 8, 1945. Source: Library of Congress. The perceived distance from ordinary life and the lack of understanding among ordinary people for the horrors of war may have contributed to Mauldin’s disillusionment upon returning home. Like many other veterans, he and his characters, Willie and Joe, struggled to fit back into civilian life. In their final appearance, they are “under a culvert” living “on the bum,” “totally out of luck, out of money”. Despite his own troubles, Mauldin himself never stopped standing up for the Willies and Joes of the world and the respect and fair treatment they deserved. Title quote from: Bill Mauldin, Up Front (New York: Henry Holt & Company, 1945), p.202. Todd DePastino, Bill Mauldin: A Life Up Front (New York: W.W. Norton & Company, 2008), pp.126-9. Bill Mauldin in a 1983 interview, in Studs Terkel, The Good War: An Oral History of World War Two (New York: Ballantine Books, 1984), p.360. A blog post over on The Dustbin of History, 18 March 2013. Seo ar siubhal an Spailpín Fánach! Nor join in the merry-making. The journey of the Rover! This song from the late eighteenth or early nineteenth century tells the story of ‘an spailpín fánach’, ‘the wandering labourer’, who hires himself out to farmers to make his living, though in this case he has chosen to forsake that life and all its hardships. Seasonal migration, both within Ireland and across the Irish Sea to Britain, formed an important part of the life cycle of many rural communities over the centuries, probably peaking in the decades immediately after the Great Famine. An estimated 38,000 migratory agricultural labourers went to Britain in 1880, and 27,000 in 1896, but numbers dropped to 13,000 in 1915, after which the government stopped collecting the statistics. Despite evidence that it did continue (though in smaller numbers) even until the 1980s, little work has been done specifically on the twentieth century. The event that garnered the most notice was a tragedy in September 1937 when ten workers from Achill Island died in a fire in a bothy in Kirkintilloch, Scotland. This prompted the establishment of the Irish government’s ‘Inter-Departmental Committee on Seasonal Migration to Great Britain, 1937-1938’, which produced a report describing the categories of labourers, primary places they came from, and recommendations, but little consideration has been given to the persistence of seasonal migration after that time. The voices of a few former migrants can be heard on the RTÉ radio documentary, ‘The Tattie Hokers: The Migrant Workers of North Mayo’. As one man says on the programme, seasonal migration was ‘a way of life’ for many, though it seems one relatively neglected in scholarly works on migration and the Irish diaspora. The most comprehensive work on the subject is Anne O’Dowd’s Spalpeens and Tattie Hokers: History and Folklore of the Irish Migratory Agricultural Worker in Ireland and Britain. However, it is organized thematically rather than chronologically, thus integrating oral testimonies and answers from folklore questionnaires related to twentieth-century movement with other similar material from earlier periods. This emphasizes continuity over change, minimizing consideration of questions such as: Did mechanization of farm work have a significant effect and how? Did seasonal migration continue but in other lines of work (outside agriculture)? How did the changing political context (Ireland’s independence, the two world wars) affect workers’ experiences? What were significant regional differences? Did certain localities continue to have greater seasonal movement and why? Sara Goek: Did you know many people that went over to work in Scotland in your time? Vincent Campbell: Of course I did know them. The last of the crowds that I heard of going over when I was young they came from Glenfin country, that’s up near, that’s just about, I suppose it would be about eight miles from here [Glenties]. They were the last that took gangs with them going over to Scotland. There was other places then down Gaoth Dobhair and places like that, they used to have a gang. They had to try to have a ganger man or a gaffer of some kind as well, but a lot of them they enjoyed going over because there was great dances on the Friday night always, they would have great dances. So it was entertaining as well. If a fiddle player would hear or a musician would hear that they were going to go on such a day, he would make sure to land at their house the night before to tell them, ‘give me a promise – bring back a good tune or a few tunes or a few good songs’ and that was a part of the bargain, that they would have to bring something like that back. The Report of the Inter-Departmental Committee on Seasonal Migration specifically mentions this region around Glenties as one of the principal places from which migration took place, with 1,352 agricultural workers leaving in 1937. Vincent’s interest in the subject is also closely connected to the cultural exchange promoted by this type of back-and-forth movement and to this day the Donegal fiddle repertoire retains its influence. Vincent himself worked on a hydroelectric scheme in Scotland when he first emigrated in 1956, following the same route as those before him, and he describes a similar social life with music and dancing on the weekends. However, despite his drawing parallels between the experiences of earlier migrants and his own, the fact that he engaged in industrial rather than agricultural labour shows the declining importance the latter as the twentieth century wore on. 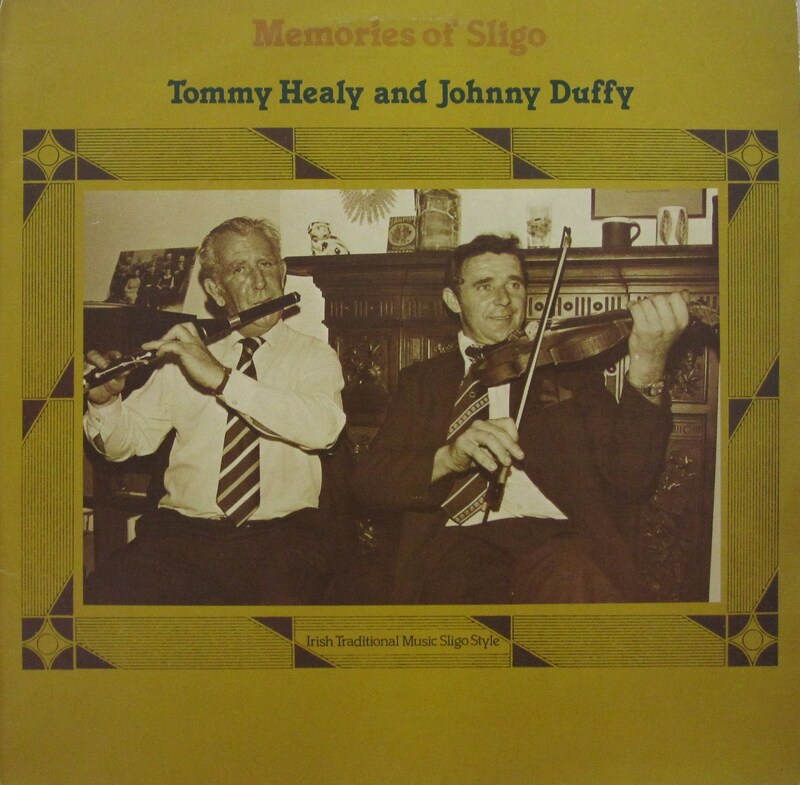 Another musician, Tommy Healy, a flute player from Montiagh, Co. Sligo then living in London, was interviewed by Reg Hall in 1987-88 for his research on Irish music and musicians in London. This area near Tobercurry is also mentioned specifically in the Report as one of those sending large numbers of seasonal workers to Britain, 352 in 1937. Tommy’s narrative of migration is especially interesting because it is multi-generational: his maternal grandfather worked as a seasonal agricultural labourer in Yorkshire and Lincolnshire in the late nineteenth century, his paternal grandfather worked as a hired labourer within Ireland, his father went to Scotland once picking potatoes but then immigrated to Boston (where Tommy was born) around the turn of the twentieth century, the family returned to Sligo in 1928 where they took over his mother’s parents’ farm, and Tommy went to England in 1943, first doing seasonal agricultural work and eventually settling in London after the Second World War, working on railways and in construction. He thus situates his own migration intimately within that of his family and local community, highlighting the normalcy of this type of global transiency, saying of seasonal employment, ‘that was the only employment those people used to have outside their own little farms’ and of going to America and back, to Reg’s astonishment, ‘it was the usual procedure’ and several other families in his parish had done the same. Reg Hall: Did you do farming work? Tommy Healy: Oh I did in the early part. That was the only way we could get over here, as a migratory agricultural worker. Reg: Can you explain that system? This was at the end of the war? Tommy: No, no middle way in the war really or even 1941 or ’42. In the area that we come from, we were given employment on this piece production and they didn’t want anybody to leave. They wouldn’t give you a permit at the Labour Exchange to leave – you had to get permission, but when it come to harvest time and that if you could prove that you were a migratory agricultural worker, then you got your permission. Reg: You could prove that in Ireland? Reg: How did you prove that then? Reg: [Laughs] prove that you’d done it regularly, you mean? Tommy: Yes, that I was there the year before and that this farmer wanted the same men as he had the year before. Somebody that was working in Lincolnshire, that was the principle part of the agricultural work, one of our own mates sent a letter to this one and that one and so on, 4 or 5 letters, such a one wants the same gang, you, you, and mention the names that he had last year. We were never there before, but the bloke in the Labour Exchange or the guard’s barracks didn’t know that. He had to do his own part before you could apply for the passport. The application for the passport had to be done in the guard barracks. He had to sign his name to it and all. Complicated as the rules for travel and employment may have appeared at first sight, they do not appear to have hindered migration by reason of their incomprehensibility. On the contrary, Irish workers were found to display so considerable a familiarity with the finer points of official requirements, and so ingenious a knowledge of the limits of tolerance which official routine was accustomed to observe, that a constant watch was needed to prevent the evasion of rules. The next best thing, I had got the passport this time, the next best thing was to sign on with an agent to do agricultural work here. You couldn’t get the work yourself because in wintertime you see it’s thrashing, hedging, all that type of thing, so I signed on and I come over here in the month of February in the middle of a blizzard. But like we got here today and we went off to the food, somebody took us to the food office, the labour exchange and everything, all the paperwork was cleared up that day, and we were out on our glory at seven o’clock the next morning into some farmer’s yard. He went on to describe conditions in wartime England: working hours (54 hours per week plus overtime), wages (£3 5s. plus a lodging allowance), blackouts (‘no lights whatsoever’), shortages (‘razor blades were hard to find’) and rationing. He did that work seasonally for about three years, going back home to Sligo at Christmas, went back to stay from 1947 to 1949, but then returned to settle in London, where he still lived at the time of the interview. These two individuals offer only a brief glimpse of patterns and circumstances of seasonal agricultural migration from Ireland to Britain in the twentieth century. They both suggest continuity of geographical patterns, but changes in the type of work and circumstances from their parents’ and grandparents’ generations. Much more work remains to be done to understand these migrants’ varied experiences and contexts. Traditional song, in Anne O’Dowd, Spalpeens and Tattie Hokers: History and Folklore of the Irish Migratory Agricultural Worker in Ireland and Britain (Irish Academic Press, Dublin, 1991), p.313-6. Enda Delaney, Demography, State and Society: Irish Migration to Britain, 1921-1971 (Liverpool University Press, Liverpool, 2000), p.28; Appendix II, Report of the Inter-Departmental Committee on Seasonal Migration to Great Britain, 1937-1938 (Stationary Office, Dublin), p.59. The report estimates that 9,500 seasonal labourers went to Britain in 1937. The 1954 report of the Commission on Emigration and Other Population Problems mentions seasonal migration only in passing in four separate paragraphs. O’Dowd in Spalpeens and Tattie Hokers provides snippets of evidence of seasonal agricultural labour in the twentieth century: in Connaught ‘‘the tradition continued right up to the 1940s and 1950s’ (p.82), ‘men and women from Ballina and Mulraney, Co. Mayo, still work as tattie hokers in the 1980s’ (p.199), and resentment of Irish migratory workers because of they had not fought in either world war (p.267), but she provides little further detail apart from citation of her own interviews. Many folklore sources were collected in the twentieth century, but it is difficult to pinpoint the time period in which they originated. Vincent Campbell, interview with Sara Goek, 12 June 2012. 9,783 agricultural workers migrated from certain areas of Clare, Connaught, and Donegal in 1937 and Glenties had the 3rd highest total of all the areas enumerated. These areas tended to be in the ‘Congested Districts’, with high population density on poor land and generally small landholdings. Appendix V, Report of the Inter-Departmental Committee on Seasonal Migration to Great Britain, 1937-1938, p.62. Appendix V, Report of the Inter-Departmental Committee on Seasonal Migration to Great Britain, 1937-1938, p.62. Tommy Healy, interview with Reg Hall part 3, 6 April 1988, British Library. He talks about the work his grandfather would have done as a hired labourer from 04:30. Tommy Healy, interview with Reg Hall part 1, 28 Oct. 1987, British Library. A.V. Judges noted in his report, Irish Labour in Great Britain, 1939-1945 (1949), that this ban did not extend to the ‘Congested Districts’ in the western part of the country and though maintained, it had little effect until restrictions were tightened further in 1944 (p.13). There were three ways of securing labour in Britain during the war: through a liaison officer, through direct contact with the employer, or through the employer’s agent. Tommy’s story falls under the second category, of which Judges writes, ‘an employer who was actually in contact with a potential employee could furnish him with a letter… through the Ministry of Labour and the Department of Industry and Commerce and the worker would then secure the necessary travel documents on producing the letter’ (p.14). Judges, Irish Labour in Great Britain, p.15.